Versatile, highly maneuverable front wheel and rear wheel drive electric forklift trucks, fully loaded with productivity enhancing features. 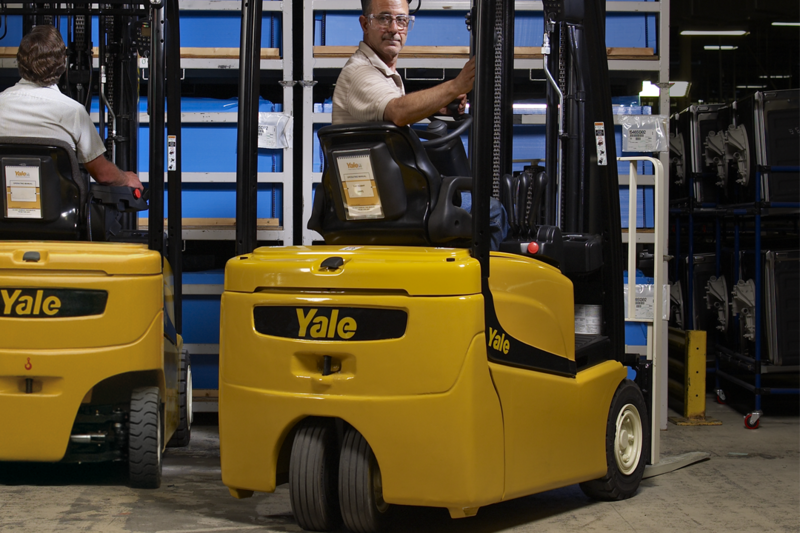 The Yale® ERP025-030VC series has been designed to maneuver in the tightest of spaces and to handle pallets in containers and warehouses, delivering a cost effective, highly productive solution to meet the requirements of applications where space is at a premium. 24-volt rear-wheel drive with AC motors throughout provides smooth acceleration and excellent travel, torque and lifting performance, delivering efficient and productive load handling. The truck has been designed with the operator at the forefront, helping to ensure as much productivity in the last hour as in the first hour of the shift. Strong chassis construction provides excellent durability and stability, ensuring the operator can maneuver and carry out handling operations with confidence, enhancing productivity. ERP-VC trucks provide tremendous flexibility to customize the truck’s hydraulic and traction performance to the application. Whether you require extended battery shift life, aggressive performance or fast travel speeds for long hauls across a factory floor, your trained Yale technician can maximize your truck’s performance. The steer column includes a diagnostic port which allows trained dealer technicians to connect the PC Service Tool for easy access to the truck’s onboard diagnostics and programming. Its low-energy AC system runs cooler and more efficiently than the competitor while lowering energy costs and lengthening service intervals to 500 hours in between maintenance check-ups. Thanks to the combination of the dual AC drive motors and the Zero Turn Radius steer axle the ERP030-040VT features industry leading maneuverability, great for indoor and outdoor applications. The ERP-VT series utilizes proven AC technology coupled with the Intellix VSM, providing enhanced performance throughout the usable battery discharge cycle. This highly efficient system also provides longer battery run time for increased throughput. Operator comfort is enhanced on the ERP-VT with ample floor space, improved operator seat position, and non-cinching seat belt. Reverse driving is made easier with the rear drive handle and swivel seat options. Yale® iSi Technology™ incorporates the same software, diagnostic codes and functionality for our main warehouse trucks creating commonality for users, supervisors and service personnel. The system offers full customization to allow a user to properly match the trucks’ performance with the skill of the operator. A service technician can use the dash display to perform diagnostics and set-up of the truck’s acceleration rate, top travel speed, hydraulic function speeds, and regen (plugging rate). The external CAN diagnostic/programming port facilitates faster field service accessibility and improves troubleshooting, programming and information gathering. The suspended Yale® Smart Ride Floor System reduces up to 65% of shocks and vibrations transmitted to the operator from dock plates, expansion joints and other irregular floor surfaces. Able to operate between -40°F and 120°F, the maintenance-free design requires no weight adjustment from the operator. The standard heavy duty mast offers optimal visibility. The optional Clear ViewTM mast offers up to 40% greater visibility than leading competitors. The fully-padded operator’s compartment is designed for side-stance operation, yet provides the flexibility of an angled stance with expanded hip room. The multifunction control handle offers simultaneous control of travel and hydraulic functions. Full proportional control for all functions is possible, as well as precise load handling capability. Controls are conveniently located for forward/reverse, lift/lower, horn, tilt, optional sideshift and an optional 4th function. The unique flat plate overhead guard configuration provides great visibility while protecting operators.